Most teenagers will develop the skin disease known as acne at some point in their young lives, and be forced to deal with the embarrassment of a ravaged complexion, as well as the loss of self-confidence that goes along with it. Fortunately, the condition subsides for most as hormone levels become more balanced and skin oiliness is reduced. However, for some unfortunate victims acne persists well beyond the teen years, and in severe instances, pock marks and scars can be left behind as unpleasant reminders of the time when acne dominated the facial landscape. In years past, little could be done about this, but nowadays there are practical and effective ways of getting rid of acne scars. What can be used to get rid of acne scars? Acne scars are generally caused by inflamed pustules or cysts which occur when skin pores become clogged with excess oil, bacteria, debris, and even dead skin cells. When skin becomes inflamed, pores swell and that causes a breakage in follicle walls. If this rupture happens near the surface, the skin lesion is generally minor and has a tendency to heal fairly quickly. When there is a deeper break in the follicle wall, more serious lesions occur and the infected material spills into the dermis, damaging healthy skin tissue. During healing, excess collagen can be generated, which appears as a raised area on the skin surface. However it is far more common for there to be depressed scars due to a lack of healing tissue, and these are the scars typically associated with severe outbreaks of acne. Scarring is much more likely to result when there is a greater occurrence of inflammation on the skin, or when there are prolonged breakouts of acne which don’t heal quickly. Acne marks are known as macules, and although they are sometimes referred to as scars, they are much different from true acne scars. Acne marks are flat on the skin, and are usually identifiable as a reddish-looking area which can easily be covered with makeup. Acne scars are much more serious than acne marks. Real acne scars have no color associated with them, but they are indentations on the skin which can’t easily be concealed, because that would require filling them in. Of the two, acne marks are probably easier to see because of their color, but acne scars are easily the more severe condition, because they are more or less permanent and give the skin an unsightly pitted look. To reduce the likelihood of acne scars, everything possible should be done to minimize breakouts of inflammation on the skin. This calls for treating any flare-up of acne as soon as it develops, and the most effective way to deal with this is to consult with a dermatologist, who can recommend a medication specific for your situation. Along with this, you need to resist the temptation to pick at or pop pimples on your skin, because this can force debris deeper into the skin layers, spreading infection to other areas, and worsening the inflammation already in progress. Picking at scabs is another taboo, because it interferes with the skin’s natural healing process, and promotes scarring on the surface. Is it possible to get rid of acne scars? Yes, it is possible to eliminate some of the more minor acne scars which occur by filling them in, under the supervision of your dermatologist or cosmetic surgeon. However, the deepest acne scars are not good candidates for filling, and must be handled by other methods of treatment. 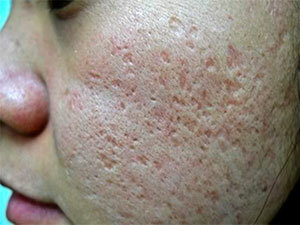 When acne scars are the of the most severe type, i.e. deeper and more pronounced scars, the most effective approach is through laser surgery. There are several different types of laser surgery used in the treatment of acne scars, and each is suited to a particular situation, but they are all effective procedures which produce very good results. 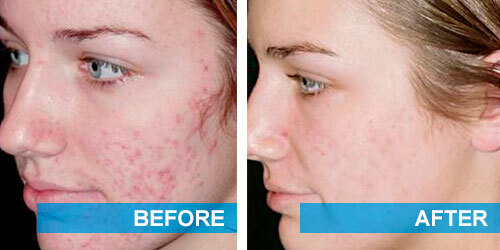 Laser treatment can effectively eliminate acne scarring. All laser treatment types are non-invasive, which means no surgery is done with knife or scalpel, and healing time is therefore much less than it would be with actual surgery. During any of the laser treatments, selected skin tissue is broken down by directing continuous, pulsed laser beams at the target area. Once these undesirable areas are broken down, fresh new tissue can form, free of the scars that were once there. After laser treatment, the scarring and discoloration generally fade away, and there is little or no remaining evidence of the skin disease. To determine whether any of these procedures is appropriate for your case, you should consult with a professional dermatologist or cosmetic surgeon. How to get rid of acne scars on the face – Pixilation targets very specific points on the body, using tiny, pin-sized laser points which are trained directly on scarred areas by a precision laser beam. The precision and localization of treatment areas makes this kind of laser treatment well suited for treating facial areas. Since the high visibility of facial skin requires the most precision and care, pixilation is often the laser treatment of choice for facial scarring. Another non-laser option for addressing facial scars is through dermal fillers, which are discussed further below. How to get rid of acne scars on the body – Carbon dioxide laser treatment (CDLT) is also called CO2 laser resurfacing, and incorporates the use of a local anesthetic or sedative, and the numbing of the affected area. After this, laser resurfacing is done and a dressing is applied to the treated area. Because of the numbing and dressing components, this is not the best option for facial scarring treatment. Fractional laser treatment is a method which is most effective for treating deeper layers of the skin. The laser beam using this procedure is divided into thousands of deep, tiny columns which penetrate the skin and help remove old cells. It also promotes the generation of new collagen, while leaving healthy skin tissue untouched and intact. Fractional lasers are often used on chest and back scars, which tend to be deeper, but not as visible to observers. How to get rid of acne scars in a week – Erbium laser treatment (ELT) is probably the best laser treatment for surface level scars, because it allows for extremely fast healing and is accompanied by fewer side effects than any other treatment option, so there would be far less swelling, bruising, and redness. This fast-acting, fast-healing capability allows ELT to get rid of your scars in a week or thereabouts. What helps get rid of acne scars? If your acne scars are less severe in number and depth, there are other alternatives beside laser surgery, but these too should be undertaken with caution and only under the guidance of a dermatologist who would be well familiar with treatment options. In some cases, the recommendation might be to address acne scar treatment with one of several types of acne scar creams, each of which has a specific purpose. Some are used for the purpose of lightening skin which has been discolored by scarring, some are used to promote the faster generation of skin collagen, and some are used simply to reduce the inflammation of the affected areas. Each of these acne scar creams would need to be prescribed by a doctor though, to ensure that it is the right treatment for your specific skin type. Sometimes dermal fillers such as Juvederm or Restylane can be used to fill in smaller scars on the face, by injecting the material into the depressed area, to eliminate the pock-mark look, and level it out with the rest of the skin surface. These dermal fillers also stimulate the growth of new collagen around the target area, to increase the natural regeneration of healthy skin. Another approach to getting rid of acne scars is through microdermabrasion, which can be used when lotions and creams prove to be less effective than hoped. This is an option which, while it is more harsh on your skin, can generally be relied upon to produce good results. It works by using a soft wire brush to gently massage the surface skin of the target area, so as to remove old, dead skin cells and encourage the production of fresh new cells. Chemical peeling is a procedure which makes use of an acid concentrate that is applied directly to the skin, so that it can dissolve away the uppermost layer, allowing for the rapid formation of new skin. This new skin will be scar-free and healthy-looking, although it does take a little while for the new growth to appear. Like microdermabrasion, it is a bit more uncomfortable than using creams, but it has been demonstrated to be an effective process. Without using surgery or lasers, the most effective way of removing acne scars includes a combination of cortisone creams, skin lightening creams, and exfoliating processes to promote new skin cell growth. No adult should have to endure the discomfort and mental anguish that acne scars inflict on hosts, especially since some very effective remedies are available and within reach of most budgets. For lesser scars, various filler treatments can be used, and there are creams and scrubs which can be recommended by doctors to treat specific cases of scarring. When creams do not produce desired results, microdermabrasion or chemical peeling may be more effective. 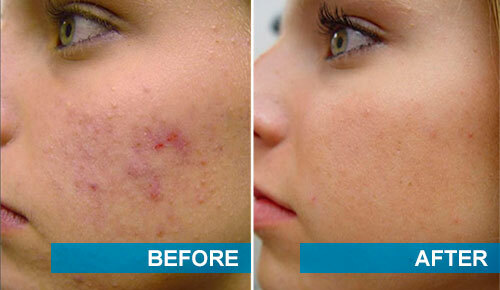 For more serious, deeper scarring, laser treatment can be extremely effective at permanently removing the unsightly ‘orange peel’ pitting look that formerly plagued acne victims.To determine the very best approach for your own situation, consult with a dermatologist or a cosmetic surgeon, and start planning out your own strategy for reclaiming healthy, vibrant-looking skin, completely free of acne scars. 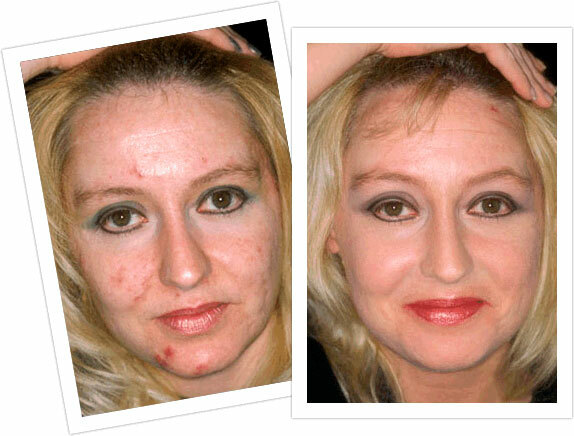 You can find further details of Acne scars here.